IC Insights recently released its September Update to The McClean Report. The 32-page Update included a detailed look at the pure-play semiconductor foundry market. Shown below is an excerpt from the Update. With the rise of fabless IC companies in China, demand for foundry services in that country has also increased. Figure 1 shows IC Insights’ listing of the top pure-play foundries and their sales to China in 2016 and a forecast for 2017. 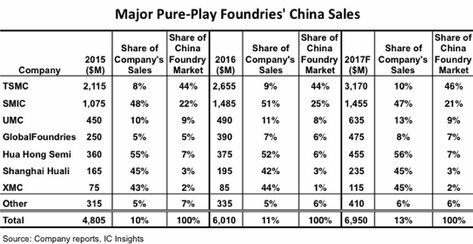 In total, pure-play foundry sales in China are expected to jump by 16% this year to about $7.0 billion, more than double the rate of increase for the total pure-play foundry market. As shown, only about 10% of TSMC’s sales are forecast to go into China in 2017, yet the company is expected to hold the largest share of the China foundry market this year with a 46% share, up two percentage points from 2016. The Chinese foundry market represented 11% of the total pure-play foundry market in 2015, 12% in 2016, and is forecast to hold a 13% share this year. As a result of this growth, most pure-play foundries have made plans to locate or expand IC production in mainland China over the next few years. TSMC, GlobalFoundries, UMC, Powerchip, and, most recently, TowerJazz have announced plans to boost their China-based wafer fabrication production. Most of these new China-based foundry wafer fabs are scheduled to come online in late 2017 or in 2018. UMC began 40nm production at its 300mm joint venture China fab in November of 2016 and the company is planning to introduce 28nm technology into the fab in the second half of this year with additional expansion plans to come through the end of the decade. It is well known that China is striving to develop an indigenous semiconductor industry but gaining access to the manufacturing technology has become increasingly difficult. As a result, many China IC companies and government entities have structured joint ventures or partnerships with foundry companies in order to access leading manufacturing technology. The partnerships give Chinese companies much needed access to production capacity using first-rate manufacturing technology and provide the foundries with an ongoing market presence and revenue stream within China. UMC is working with Fujian Jin Hua IC Company to construct a 300mm wafer fab in Fujian, China to manufacture DRAM using 32nm process technology developed by UMC. GlobalFoundries joined with the Chengdu Government in 1Q17 to begin building a 300mm wafer fab that will manufacture ICs using mainstream 130nm and 180nm processes. Completion is set for early 2018. TSMC started construction on a wholly owned $3 billion fab in Nanjing, China that will serve as a foundry that manufactures ICs using 16nm technology. Production is scheduled to begin in 2H18. TowerJazz signed an agreement with Tacoma Semiconductor to construct a 200mm wafer fab, also in Nanjing, China. TowerJazz will have access to 50% of the capacity. Tacoma is responsible for the entire investment of the project. Additional details on the IC foundry market and other trends within the IC industry are provided in The McClean Report—A Complete Analysis and Forecast of the Integrated Circuit Industry (released in January 2017). A subscription to The McClean Report includes free monthly updates from March through November (including the Mid-Year Update), and free access to subscriber-only webinars throughout the year. An individual-user license to the 2017 edition of The McClean Report is priced at $4,090 and includes an Internet access password. A multi-user worldwide corporate license is available for $7,090.